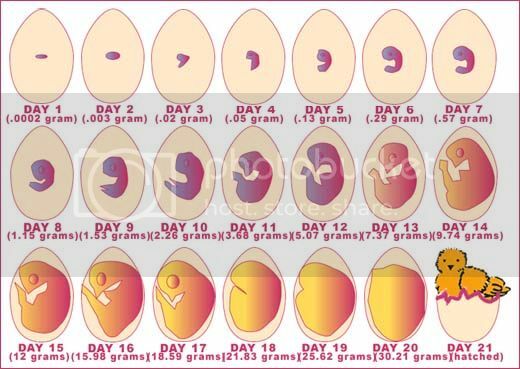 One of Natures mysteries is the transformation of the egg into the chick. A chick emerges after only three weeks of incubation. The complexity of the development is not always understood. Hopefully this is an easy explanation. I like the words! I think this is one of the best posts. I loved it when I was waiting for my Clara to hatch her brood, I got to read each day where my little treasures were up to, thanks to your post. I tell everyone to read it when I know they are hatching chickens or incubating eggs. Soon to become breeder of Lavender Pekins and multi-coloured Silkies. Do you know what happens if the hen comes off the eggs for extended periods at different times in the process? For instance how much cooling down of the egg can cease it's development?